The CRON philosophy states that no matter what technical problem you have, contact us, we will find a solution. There is nothing we can not link! The CRON team can create individual solutions for customers which are very economical and affordable. Over the years, many solutions have been developed in a wide variety of industries. These can be solutions with industrial weighing technology or special programming of microprocessors and controllers. In the creation and production of steel, so-called masking agents are needed. These are made using sophisticated recipes. The raw materials are stored in different silos. The CRON recipe system controls the complete weighing process via a central silo scale, permanently learns the flow properties of all products and permanently corrects the dosing errors that have arisen. The CRON counter weighing systems have frequently been used by suppliers to the automotive industry. The basic idea here is that e.g. 10 pieces of an article (e.g. a lambda probe) are weighed on a precision scale and then a whole grid box. Then you know how many lambda probes are contained in the grid box. As a rule, the printing of carton labels is always required and the printing of a VDA label (association of automotive suppliers) for the pallet / lattice box. The CRON team has realized several solutions for the wire drawing industry. Again, industrial scales are always the focus. Usually, the rings are weighed after each operation. As a result, the order progress is permanently maintained. You can get a perfect batch assignment and documentation. Usually, each ring is provided with its own label and receives its own ring number. There is a high demand on the label material, due to the harsh environment, as well as the resulting printing technology. CRON has perfect, industrial-grade solutions here. CRON masters a speciality, the programming software for safety-related applications. This specialist know-how is used in the programming of door and door control systems, whether they are sliding doors, hinged doors or revolving doors. Such programs must pass through a strict acceptance procedure of TÜV and VDS. They must comply with very strict regulations. CRON masters the topic perfectly and has developed its own multitasking systems for the processors of the NEC and ATMEL mega family. All relevant test routines are installed as standard in these multitasking systems. Worldwide, these systems are installed in large numbers, including in the US, which in turn have other, sometimes more far-reaching regulations. 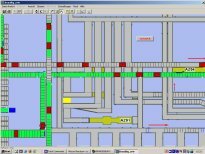 The task here is to display dynamic processes on a screen in real time, so that the plant operators in the control room can obtain a perfect overview of the current situation. 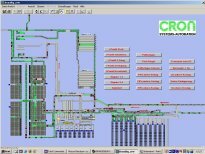 CRON focuses on the visualization of conveyor systems and systems. Therefore, the components conveyor tracks, stoppers, pushers, light barriers, etc. are easy to recognize here. In the case of serious errors, messages are generated that must be acknowledged by the plant operator. Such errors are already detected before a system shutdown and can be remedied early.